If you haven't read my earlier article on security, you might want to do that first. This article is going to dig deeper into Vault's the security framework. That's right, there's even more. The good news is that the hard stuff is over. Now that you know what an ACL is an how it's used to calculate the read, write and delete permissions, we can talk about how ACLs are hooked to files. A folder can have an ACL on it. That ACL will not only apply to the folder itself, but it also applies to any files in that folder. 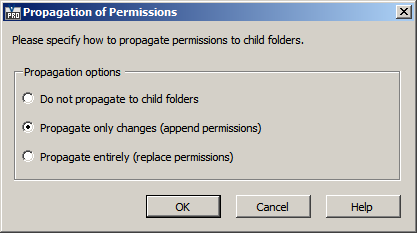 If a sub-folder is created, it will inherit the ACL from the parent folder, but this can be changed later on. 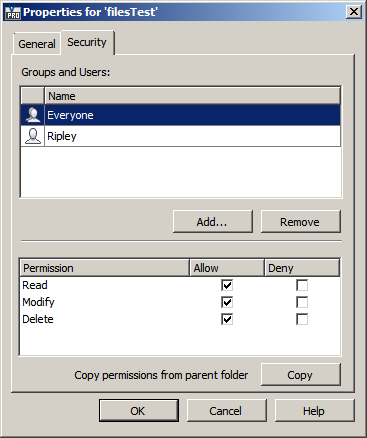 When you change the ACL on a folder it immediately applies to the files in that folder. There are also some options for propagating the changes to sub-folders. A file can have 2 ACLs on it. One comes from its parent Folder and the other one is something called a System ACL. If present, the System ACL overrides the Folder's ACL. The 2 ACLs are not merged in any way. The System ACL completely wins out. So you may find cases where the folder says that the user has read only access, but they can edit certain files in the folder. 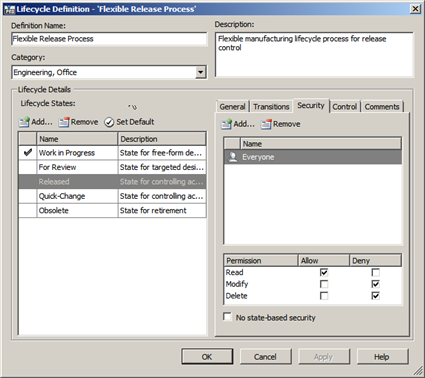 If the Vault is not set up to use Item security, then the file's lifecycle state dictates the System ACL. If the Vault is set up to use Item security, then the item's security settings dictate the System ACL. This is only for cases where the file is linked to an Item and the Item is in the Released state. The file's System ACL can be set explicitly in the Properties dialog under the file menu (not to be confused with the Properties grid). Setting the System ACL in this manner will overwrite any file or item lifecycle security settings. At the API level, you use SecurityService.SetSystemACLs(). Regardless of how the System ACL is set, you can read it using SecurityService.GetEntACLsByEntityIds(). Even nicer is that the function returns both the regular ACL (the one from the folder security) and System ACL. Autodesk is an American company, which means there is no such thing as having too many legal disclaimers. Therefore I would like to re-iterate parts of the legal disclaimer for this blog. Any applications on this blog are experimental in nature. They have not been tested in any manner, and Autodesk does not represent that they are reliable, accurate, complete, or otherwise valid. Accordingly, those applications are provided “as is” with no warranty of any kind and you use the applications at your own risk. In other words, you are free to use the applications (and source code) in your Vault, but the burden is on you to test and make sure it is suitable for your environment. There is definitely a difference between my small development vault and a production Vault with hundreds of concurrent users. Here are some code snippets to help you out when dealing with replicated environments. One of the first things you will probably want to do is figure out which workgroup you are connected to. This one is pretty easy, just call GetLocalWorkgroup() in the ReplicationService. 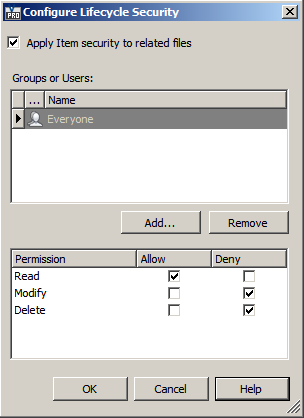 If you want to get the list of all the workgroups connected to your local workgroup, you can call GetAllWorkgroups(). If replication is running, there should be only 1 publisher and the rest should be subscribers. The next thing you will probably want to do is figure out which workgroup owns the thing you want to work on. The best way is to use GetOwnershipByEntityId. For files, items and change orders you can use the "Current Owner" property, but the result is designed more for human readability. It's not very good for program logic because there are a couple of string formats that are used depending on the workgroup settings. This is the error you get whenever you try to do something on an Entity that you don't own. You can minimize the chance of getting this error by checking the "Locked" property on the object. However it won't hit all cases and some Entities don't have a Locked property. First you need to detect the error. You can do this the same way you look up any other error code. There's nothing special here. Next you need to decide how to handle the error. This one is up to you and what make sense for your application. Common options include A) displaying the error to the user and B) automatically attempt to gain ownership. Here is how you transfer ownership of specific Entities. You can transfer things in groups, which mean that all Entities in the group transfer or none do at all. This feature is useful if you have a group of things that you need to work on. If you are transferring multiple groups, it's possible for one group to fail while another succeeds. So you need to check the XferStatus to make sure the transfer succeeded. So your code just transferred file ownership to your local workgroup. You can start working on it, right? Wrong! You need to wait for SQL to replicate the Entity data before you can start using. The reason is because the Transfer function you called edited data on the remote workgroup, not your local workgroup. Every other API function that edits data does the edit on the local database, but the Transfer functions are special. So how do know when you have ownership for real? The only way is to constantly check the ownership until it shows that your local workgroup owns it. // check the ownership. Give up after 120 seconds.
' check the ownership. Give up after 120 seconds. Note: Make sure that your loop has an exit. If the network goes down between the two workgroups, your program would be halted indefinitely. My blog has been online for over a year now, so it's a good time put out a quick survey to see how things are going. All the feedback I've had so far has been overwhelmingly positive, but I'd still like to get a bit more information about who my readers are and how the blog is used. If you could take a minute or two to fill the survey out, I would appreciate it. Update: These steps only work for the Vault 2011 version of the DLL. Go here if you are using Vault 2012. A couple of people have had issues with the fact that Autodesk.Connectivity.WebServices.dll is unsigned. This is a problem if you want to sign your project. Visual Studio won't let you sign something if it references an unsigned DLL. Fortunately, there is a trick you can use to sign the WebServices DLL. The trick involves SN.exe, ILASM and ILDASM.exe, which are .NET tools provided by Microsoft. You basically de-compile the DLL to IL code, then you re-compile with a key. If all goes well, you will end up with a signed WebServices DLL. The original DLL is still there, but it's been renamed with a ".1.dll" extension. This trick will work with any .NET assembly, so don't let unsigned references prevent you from signing your project. One of the worst tasks you can get as a programmer is having to write an installer. Installers are hard to write, hard to debug and hard to maintain. What's worse is that nobody appreciates all the hard work you did. As far as the end user (or your boss) is concerned, an installer is either "adequate" or "a complete piece of garbage". Those are the only 2 states. There is no in-between and no way to go above adequate. Nobody ever says, "Wow! What a great installer!" And don't even get me started on the MSI framework. Anyway, you may have noticed that most of my samples are deployed via an installer. So I've posted a simple Visual Studio 2008 installer project that you can use to deploy your custom Vault Explorer extensions. Detects if Vault Collaboration, Workgroup or Professional client is installed and sets the [VAULTWGDIR], [VAULTCOLLABDIR] and [VAULTPRODIR] paths respectively. If the path is empty, then it means that the client is not installed, and the path will be empty. Installer will not work if it doesn't detect one of the above mentioned Vault clients. Performs a menu reset, so your custom command should show up after the installer runs and your restart Vault Explorer. You can look at the MSDN documentation on how to work with installer projects. Also, Kean Walmsley posted a great 3 part series on installers on his blog. To use my installer project, you basically have to change the parts that say "ChangeMe". Next you add your files to the appropriate folders. For example, if you are supporting all Vault Collaboration and Vault Professional, then you would add your extension files to both of those locations. Make sure to set the appropriate condition for each file you are installing. For example, all Vault Collaboration files should have [VAULTCOLLABDIR] as the condition. You may want to update the Vault2011 launch condition if you are not supporting all 3 customizable Vault clients. Warning: Use of this project may result in you getting stuck as the "Installer Guy".